I'm not a huge fan of testing complex projects because probability makes it quite likely that something will go wrong. That being said, it has been nearly three years since I first started working on this printer and its about time some plastic gets melted. There is some minor slicer configuration that needs to be done before I can start printing. I wrote a custom Start G-code to use the built-in servo homing routine, but the slicer configuration is otherwise normal. Remember that I re-configured G29 and G30 to interface with the servo drives, so they do not serve their usual purposes. This non-standard homing routine confuses most host software but runs fine on the printer. You can see that Pronterface thinks I'm printing below the bed! Beyond that change, I mostly went with Slic3r Prusa Edition defaults and sliced a basic calibration cube. Here are the first prints. 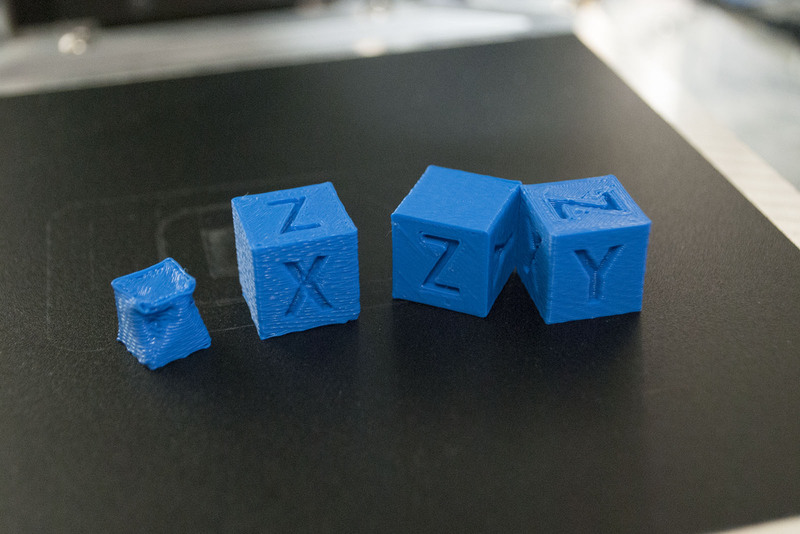 The first two cubes are awful and can be attributed to poor calibration, but even the later prints have obvious surface finish problems. 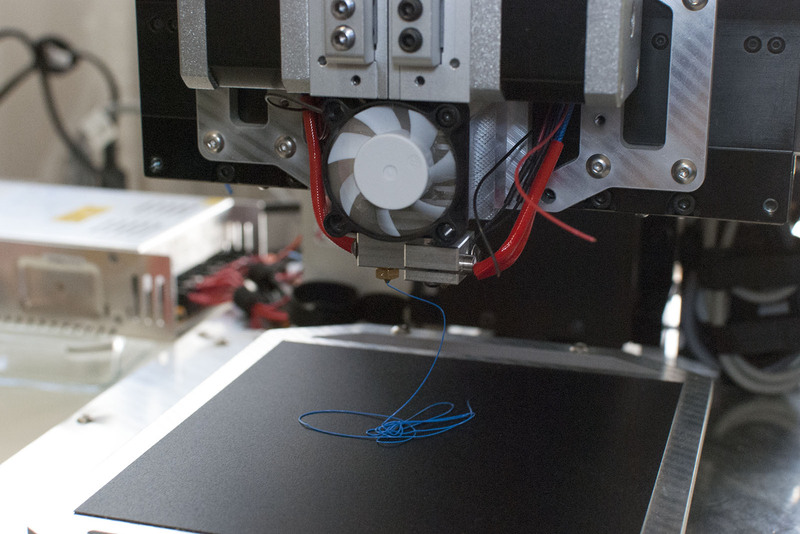 Surface finish problems can come from many different sources. At this point it is quite likely to be a configuration/tuning problem as I am printing without a fan and have not adjusted my E-Steps or print temperature away from the defaults. On the other hand, these artifacts are a lot more serious than I would expect to see from incorrect print settings. I designed a special test print to help investigate the issue. It starts as a rectangle with two sides bent at a very slight angle. This will help tease out any motion quality problems since both the X and Y axis will have to vary their speeds throughout the print. The second alteration is that the shape has a very slight taper. 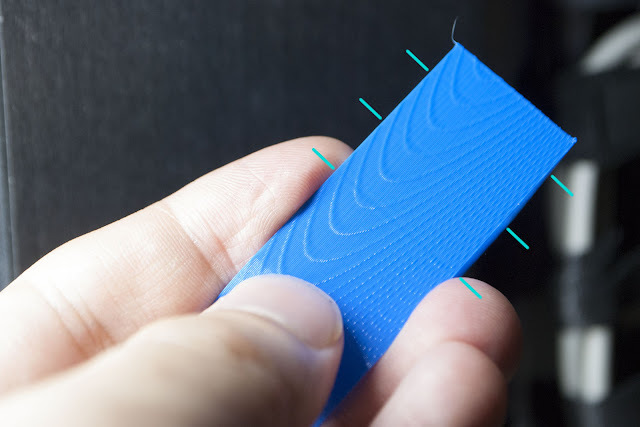 The taper is absolutely critical, because a varying the circumference will cause any extruder-based artifacts to produce curving moire patterns that can be easily differentiated from motion problems. 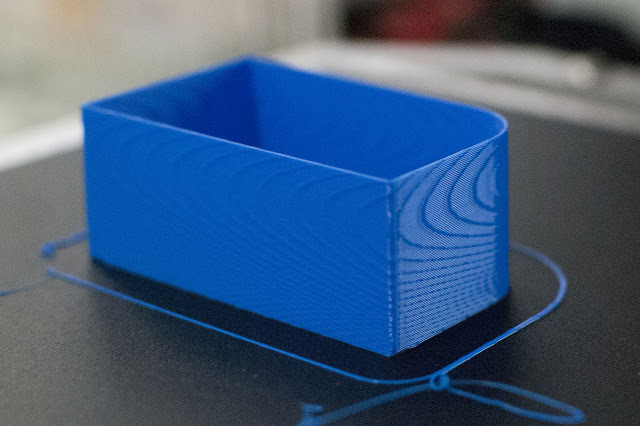 The test shape is sliced with a single wall and no infill to eliminate any slicing/calibration artifacts; I want this print to test only axis motion and extrusion. The printer is very quiet except for a satisfying thunk as the Z axis steps upwards for each new layer. Unfortunately the print has very severe banding, which confirms that something is wrong. Since the pattern is curved we can identify the extruder as the source of the banding. 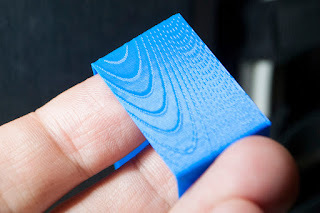 Aside from the banding, this print is actually quite nice. The layers are extremely well aligned and there is absolutely no ringing on the corners. That last bit is very impressive as the hot end weighs almost a kilogram and was being accelerated at 2,000mm/s2. The X axis also looks pretty good but has some vertical artifacts. This error is quite subtle, so I've marked it in the following picture. Although this error is much less pronounced than the extruder banding, it is concerning because it is unexpected. The MX80L stages should not be producing this kind of artifact. I currently suspect the error is a result of improperly tuned gains letting some cogging slip through, but it could also originate from many other sources such as a blip in step generation from the Smoothieboard or even physical damage to the MX80L stage. For now, however, I'll focus on solving the consistent and periodic error in the extruder. This could be caused by one of several things, including micro-stepping problems, insufficient extruder current, poor hobb geometry, or low quality stepper motors. I'm somewhat annoyed that the extruders are a problem given that they are an off-the-shelf 3d printer component, but all-in-all this was a fairly successful first test. Nothing caught fire, and the problems I'm seeing are localized which will make them easier to troubleshoot. I've been following this project for a while and your detailed writeups are amazing. Hopefully the vertical artifacts are just a software problem.